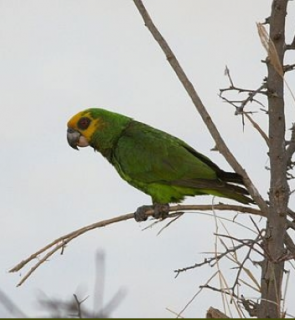 The Yellow-fronted Parrot (Poicephalus flavifrons) is at risk from the loss of its Juniperus, Podocarpus and Acacia forests to illegal logging. Outcomes: The team addressed specific questions about the percentage of area occupied by the birds, their approximate decline over time, and other statistics. Although it is thought that the Yellow-fronted Parrot has a small distribution more knowledge is required before their conservation status can be determined with any confidence, and realistic and effective conservation measures can be proposed. Where found: P.f. flavifrons: Highlands of N Ethiopia, and areas around Addis Ababa in C Ethiopia. P.f. aurantiiceps: Known only from Masango area and Gilo River, SW Ethiopia. History: The Yellow-fronted Parrot (Poicephalus flavifrons) is at risk from loss of suitable habitat in a number of areas (Y. Dellelegn in litt. 2012, Boussekey et al. 2002, 2004, M. Boussekey in litt. 2012) but data on the extent of their decline is lacking. Local extinctions have reportedly occured in a number of areas. Their basic ecology was studied by Marc Boussekey and colleagues in the early 2000s in the south and west areas of Ethiopia. No information exists yet from northern areas. Declines in population have been recorded in Bale National Park and Wondo Genet (Y. Dellelegn in litt. 2012). More robust flocks of fifty parrots or more can still be found where suitable habitat remains intact (M. Wondafrash 2012 in litt. 2012). Ecology: The Yellow-fronted Parrot (Poicephalus flavifrons) is found from 1800-3000m (5904-9840 ft) in Juniperus and Podocarpus forests. They are also found in woodlands in cultivated plateau country and in gallery forest in Acacia savanna. They consume buds, seeds and fruits and vegetables, some cultivated. Birds are generally found in pairs, small groups or flocks up to 20, often with Black-winged Lovebirds (Agapornis taranta).